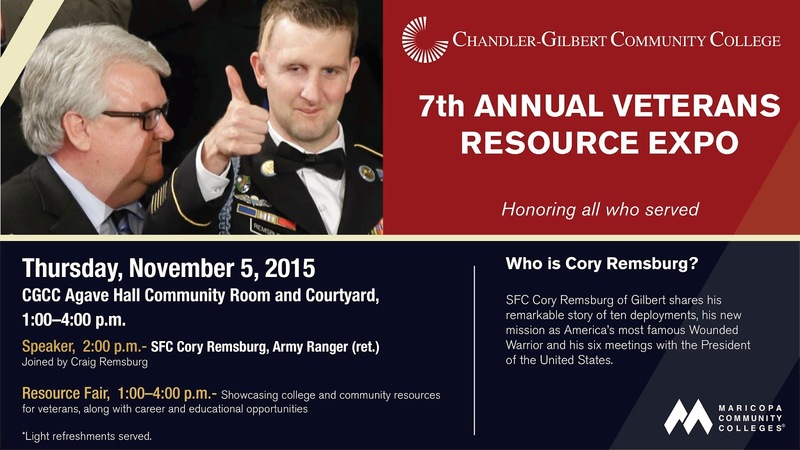 Gilbert resident and retired Army Ranger Sergeant First Class (SFC) Cory Remsburg will serve as the guest speaker at this year's 7th Annual Veteran Expo at Chandler-Gilbert Community College (CGCC) on Thursday, November 5 from 1 to 4 p.m. While at CGCC, Remsburg will share his remarkable story of 10 deployments, his new mission as America's most famous 'Wounded Warrior,' and his six meetings with the President of the United States. In October of 2009, Remsburg suffered severe brain trauma and was left partially paralyzed by an IED explosion in Afghanistan. After undergoing dozens of surgeries and years of rehabilitation, Remsburg has made a miraculous recovery; however, he is still blind in his right eye and partially paralyzed on his left side. In 2014, he received a two-minute standing ovation at President Obama's State of the Union address for his military service. Today, Remsburg serves as an advocate and spokesman for injured veterans. "Cory's story of courage, both during and after his ten deployments is an inspiring message for everyone, not just college students or student veterans," said Reda Chambers, Veterans Service Coordinator at CGCC. "We hope residents of our surrounding communities will also attend and hear Cory's remarkable story." While at the event, veterans and their families can network with local businesses about job opportunities and learn about veteran resources and services offered by CGCC and community groups. The event is also an opportunity for non-Veterans, in advance of Veterans Day, to honor those who have sacrificed to serve our country. "The Veterans Expo allows us to showcase college and community resources that may help our veteran students be more successful, and gives us an opportunity to offer our heartfelt thanks to CGCC's more than 500 student veterans in the week leading up to Veterans Day," said Chambers. About 30 exhibitors from a variety of government and community groups as well as businesses and organizations looking to hire veterans will have tables at the Expo. Among these are the VA and VA Healthcare, VA Vet Centers, Arizona Department of Veterans Services, DAV, VFW, Fleet Reserve Association, Veterans Stand-Down, Department of Labor and employers such as Boeing, Chandler Police Department, Phoenix-Mesa Gateway Airport and State Prison. Arizona State University and Northern Arizona University will also have their military outreach specialists in attendance to speak with students about transferring. The 7th Annual Veterans Expo will be held inside the Agave Building Community Room at the Pecos Campus located at 2626 E. Pecos Rd. from 1 to 4 p.m. Remsburg will address attendees at 2 p.m. The event is free and open to the public, particularly student and local veterans. Complimentary refreshments will be served.